I enjoyed visiting this 1,043-acre park. As someone who enjoyed wooded walking/biking trails, I especially liked 3.6 miles of nice wide trails in a dense woods surrounded by wetlands and plenty of wildlife. There is a link below to the parks brochure and map of paths, with names such as: Prairie Pathway, Old Orchard Loop, Coyote Corridor, Heron Loop, Red-tail Run West, Red-tail Run East, Fawn Loop, and Turkey Loop. In terms of wildlife, there is a man-made rookery (built in 2006) to start a great blue heron colony and nesting site. The wetlands and park are also home to coyote, red and gray fox, mink, and Michigan's only venomous snake, the massasauga rattler. Deer are so plentiful that the park holds a limited archery hunt every October. Bird watchers will also enjoy the park for the spring migration with sandhill cranes, wood ducks, and warblers among the species. The land the park was once slated to be a trail park when Oakdland County began acquiring the land in 1992. 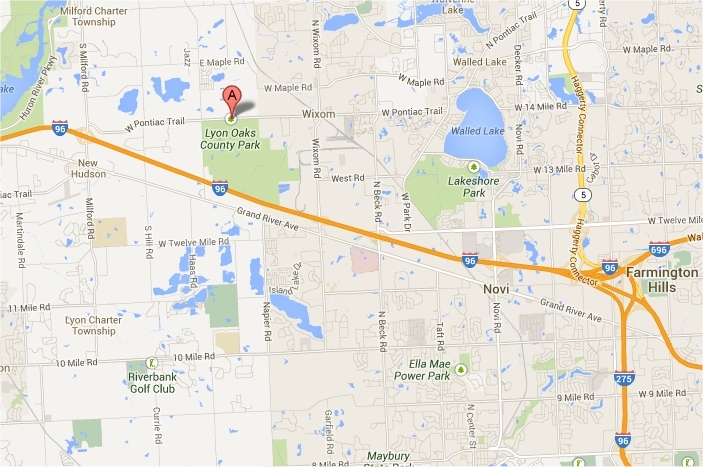 In 2002 the Lyon Oaks Golf Course opened. In 2003, the first phase of a trail system was added, as well as a small nature center, and a 13-acre off-lease bark park. "At Lyon Oaks County Park, the wetland was established by eliminating ground and surface water drainage. Existing agricultural drain tiles were broken to maximize the amount of water retained on the site. Extensive site grading occurred to form the wetland basin. Finally, berms and water control structure were installed to retain surface water. ONce the wetland basic was prepared, a no-till drill was used to spread a custom seed mix that included native emergent and wet meadow plant species. Finally, native prairie seed mix was applied to the seven-acre buffer surrounding the wetland basin. Based on the site's history and soil type, the area will be restored as a wet meadow. Wet meadows have soil that is saturated with water, but unlike a marsh or swamp, there is no standing water for most of the year. Because of this, they do not usually contain fish, but can support other wildlife, such as birds, mammals, reptiles, and butterfies. Plants in a wet meadow are mostly sedges, rushes and wildflowers. This ecosystem is becoming less common. WIth the onset of development, many existing wet meadows have been either filled or converted to open water ponds. Establishing a wet meadow at this site provides an outstanding opportunity to conserve a unique Michigan ecotype. The wet meadow offers diverse habitat for wetland-dependant wildlife such as amphibians and waterfowl. The adjacent prairie will offer habitat for upland wildlife. Pheasant, quail, deer, rabbit and turkey, as well as predators like snakes, hawks, coyotes and fox may use this area for both food and shelter. Approximately 80 logs, large root wads, and felled trees were installed within the constructed wetland basin prior to seeding. These habitat structures are designed to provide feeding nesting, shelter and winter cover for park wildlife." "Based on verbal histories of Spencer family members, who have owned much of the park property since 1857, a nesting colony - rookery - of great blue herons has existed in Lyon Oaks for at least 75 years prior to the early 1990s. In 1988, 257 heron nests were reported. During the 1990s the rookery dissipated, which is not uncommon when nesting trees fall. This man-made rookery is an effort to bring nesting herons back using utility poles with pre-fab nesting platforms. Less likely to fall than trees, they can be placed where needed. Also, predator guards can be easily installed. DTE Energy gratiously donated the poles, labor, and equipment to install this rookery, the first of its kind in Michigan. It will serve as a model for other heron restoration efforts." Archery deer hunting in a limited area from Oct. 1 - Jan. 1. Michigan DNR rules apply.